Since 2000, The Jerusalem Fund Gallery Al-Quds has been the sole full time area showcase for the exhibition of contemporary art by Arab-American and Arab artists. The Gallery Al-Quds specializes in the work of Palestinian artists, with an additional emphasis on the work of contemporary artists whose art centers on issues of the Arab and Islamic world. 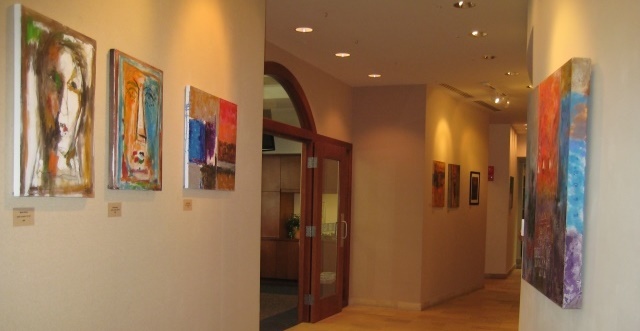 Gallery Al-Quds exhibits work in a full range of media including painting, sculpture, photography, film and mixed media. For more information about the gallery or individual artists, please contact Dagmar Painter, Gallery Al-Quds Curator at (dpainter@thejerusalemfund.org). Gallery Al-Quds welcomes inquiries from artists wishing to exhibit in our space. Please send an email with a short resume and several digital samples of your work to Dagmar Painter (dpainter@thejerusalemfund.org). Gallery Al-Quds reserves the right to review all work for appropriateness, space and schedule considerations. Please note that we program a year in advance.